This game helps children to learn and recognise initial sounds. Make a dice. This one is made from a tissue box. 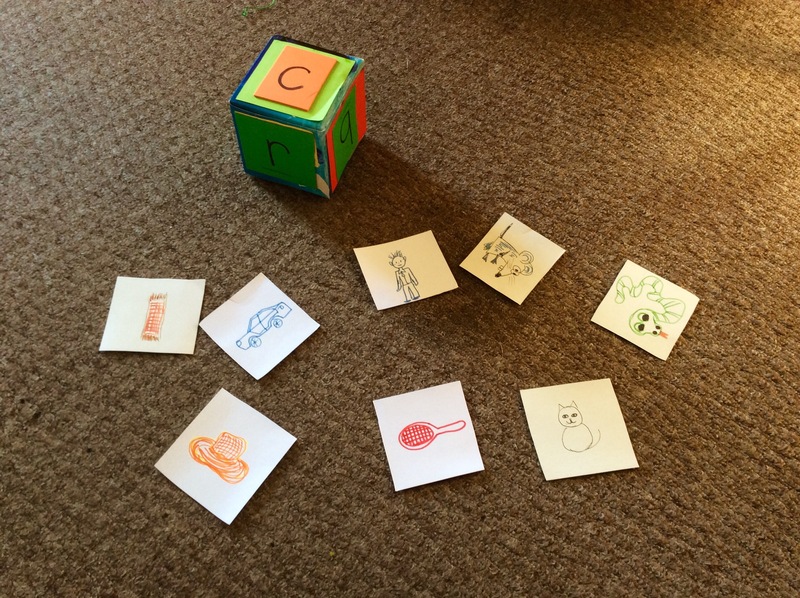 Choose six objects which your child will recognise easily starting with different letters. Write the initial letters on the dice. Then let the child draw his/her own pictures on pieces of card . Try to choose objects with short, 3 letter names. For example for the letter C there could be pictures of a cat and a car. For m pictures of a man and a mat etc. The dice is thrown and the object of the game is to choose a card with an object that begins with that letter sound and to name the object. Competitive version: the cards are placed on the floor or table and whoever gets the correct card first, keeps it. Non competitive version: make sufficient cards so each child can have a set. When the dice is thrown each child chooses a card with the correct object from their set. This game can be used later for word recognition by writing the name of the object on the reverse side of the card. The cards are then placed on the floor with the word side showing instead of the picture.